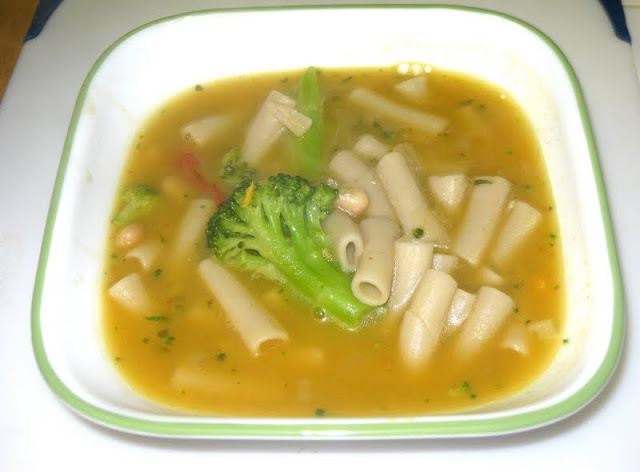 This week, I made Broccoli Soup with Beans and Pasta. This is the easiest recipe, the perfect one to make when you come home from work, with little impetus to fuss, in the kitchen. It has few ingredients and is from the book, "Thirty Minute Pasta" by Giuliano Hazan. This is my contribution to our group of cooking ladies who weekly attempt to make a recipe from this book. The recipes are generally easy, yet delicious. Check out the blogs of these ladies Kayte, Margaret, Peggy, Glennis to see what they have made this week. I am anxiously awaiting cool weather so I can start making Hazan's soups. This one looks tasty.